Her guardians weave the final black shroud." 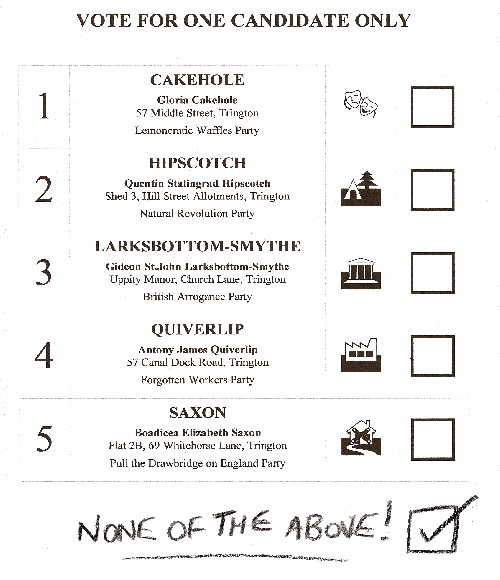 > "None Of The Above"
> "Ode To Magna Carta"
> "The Road To Number Ten"
Lallafa Jeltz is the pen-name of a London-based writer, whose hobbies include confusing tourists, drawing moustaches on newspaper pictures of celebrities and shouting at the screen during BBC's Question Time. 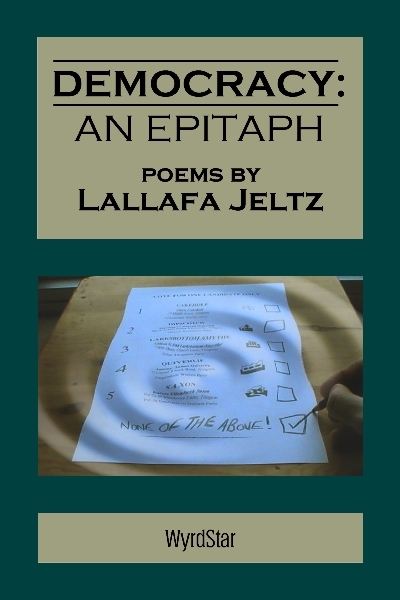 Democracy: An Epitaph is Lallafa's first poetry collection. Lallafa can contacted via Twitter [@lallafa_jeltz]. The SMASHWORDS edition is available for 'you set the price'! The WYRDSTAR edition ( pdf) is available free of charge. ISBN: 978-1310872419 (Smashwords); ASIN: B00VYP5C2Q (Kindle). Do you have the latest version? Ebooks are periodically revised to update endpapers following new releases and to correct any errors. April 2015 - First ebook edition. NOTE: If you obtained this ebook from Smashwords, you can download subsequent updates at no extra cost. Ebook stores and Digital Rights Management (DRM) - Ebooks distributed from Smashwords are DRM-free, which means that once you have purchased a title, you can download it as many times as you like (and in whatever format you like) and make back-up copies if necessary (for personal use only!). WyrdStar's preferred sales outlet is Smashwords, not least because the author gets a larger slice of the list price there than anywhere else! WyrdStar ebooks sold via third-party outlets (Amazon, iBookstore, etc.) will be subject to the vendor's terms and conditions. With 'cloud'-based systems, an ebook sale will be treated as a purchase of a licence to read, rather than the purchase of a digital file itself. All content (c) Steph Bennion, WyrdStar and Danse Macabre 2007-2019.